Yesterday, I shared some insights from a fantastic article on the antecedents of meaning in work that has recently been published in the MIT Sloan Management Review. One of the central insights of that piece is the notion that managers can only “prepare the soil” , but they cannot create or grow meaning at work for their employees. Yet, researchers Catherine Bailey and Adrian Madden found that bosses do play a big part in destroying the experience of meaningfulness at work. They interviewed 135 people from very different walks of life. From that material they distilled “seven deadly sins” that bosses frequently commit – and thereby diminish or outright devastate their peoples’ sense of meaning at work. Here are the key takeaways by way of an infographic. Share and enjoy! This week, I stumbled upon a fascinating article in the MIT Sloan Management Review written by Catherine Bailey and Adrian Madden. They interviewed 135 people from 10 different walks of life in order to find out what makes their work especially meaningful – and also, what destroys their job-related sense of meaningfulness. While I´ve read other articles that provide valuable syntheses of meaning in work in the past (see here, here, and here), this one is especially rich in context, providing in-depth personal accounts of peoples´ experiences. This makes the findings especially palpable. Meaningfulness is not dependent on the type of work. A garbage collector can experience the same amount of meaning in work as a nurse or a doctor. Bosses (and specific leadership behaviors) are typically not perceived as a source of meaningfulness. Yet, they can easily destroy the perception of meaning in work. More generalized, the creation of meaning in work is an individual endeavor, while its dismantling is caused by others, or the organizational system as a whole. Moreover, the researchers describe several crucial components of meaningful work. They´ve inspired me to create this infographic based on their findings. Share and enjoy! 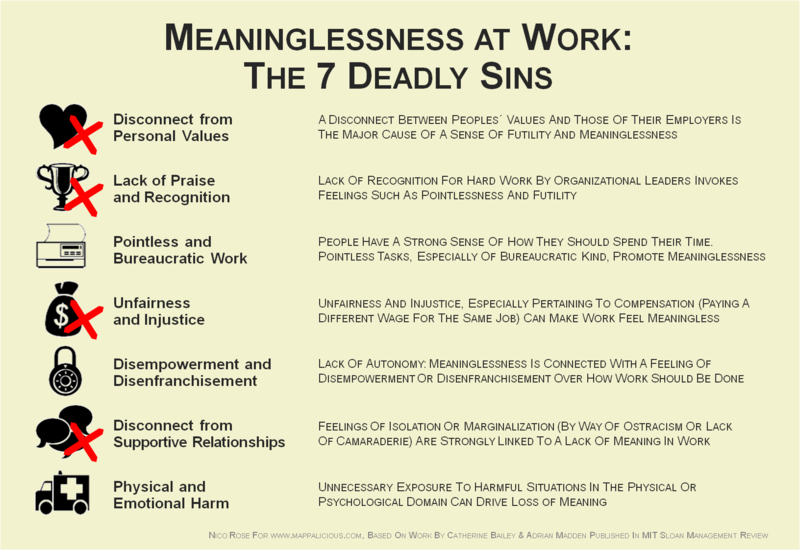 Additionally, Bailey and Madden describe the “seven deadly sins” leaders can commit to destroy meaningfulness. I´ll share those in the upcoming post.